Hello my name is Frank and I am from Europe. This october I want to visit the Mojave Desert for two days for herping. I am interested in finding rattlers and spiders, specially Latrodectus (Black Widows). 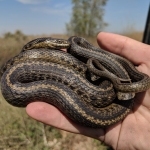 Is there any herping group I can met? Someone wants to enjoy? Where are some good spots, please via private message. I only want to photograhy, do I need for this a Fishing/Hunting Licence? The mohave desert is tough in the fall. Any chance you can go a bit further south into the sonoran desert? For rattlesnakes, I'd plan to road cruise as much as possible. Black widows I usually find under debris and around humans. Think abandoned buildings and junk piles. Good luck! It sounds like a fun trip. I went to the Mohave in Northern Arizona and Las Vegas in September and activity was slow. We still found stuff (including a pyro up in the mountains), but road cruising was basically dead, especially down in the flats. The answer to your question regarding licenses needed: none needed. But I have to agree with other comments so far in terms of time of year for herping the Mojave (at least the eastern Mojave). October is near the bottom of the list of most desirable months in the herp active season here. Might be able to offer some advice when you get nearer your departure date based on current events. I have to do an add-on to my last message lest I steer you into trouble. When I considered the license question I thought only of my home state, Nevada. Arizona & California (& to a much lesser extent Utah) also include the Mojave Desert within their boundaries & each of these has license requirements. ...glad you amended your post lest we steer this chap down ticket road. In CA you should have a fishing license on you while herping or you will likely be cited, worst case,or have a premature end to your hunt. It’s a silly law that, for some reason, remains unchallenged. ...glad you amended your post lest we steer this chap down ticket road. Frank the main thing to keep in mind is that in USA wildlife is a publicly-owned resource, an "estate" that for the most part is severed from land ownership (another "estate"). The principal wildlife-management authority resides at the state level. So if you want to herp "the Mojave" in e.g. CA, NV, UT, and AZ you have 4 completely different rule sets - and interpretive & enforcement cultures & capacities - to follow. Also know that, in general, "to take" = "to hunt, pursue, capture etc etc etc". So unless you are absolutely and completely hands-off, and also are not actively looking for herps but you're just out for a walk and happy to see whatever you see - you are "taking" therefore you need a license if one is required by that state. Now, as everyone has said (believe them) having a good time in October in the Mojave is super easy if you're not hung up on finding herps. The weather is sublime, the scenery idyllic, the traffic and crowding minimal. Honestly these words describe much of the western USA at that time of year. There are places where the herping would be better!!! Either the Sonoran or the Chihuahuan deserts would be much better, due to the fact that they have "reliable" growing-season rainfall - it's part of their climates, and the animals "know it". Whereas the Mojave and Great Basin deserts, particularly as you move farther and farther west, have dry summers and "wet" winters. So fall is just awfully dry, and spring is really the only game in town. So this pretty much steers you to S AZ, S NM, or W TX. The simplest state from a compliance standpoint is probably AZ. All 3 require a hunting license (you would buy a short-term, out-of-state version). But TX has some quirky requirements about reflective vests (kind of like France for driving), and there's a real lack of places to get out and walk around and herp legally (it's all either private or park; the key exception is the opublic roadside, which is why you see and hear so much about "walking cuts" - these are roadcuts blasted through hills that stand in the way of a straight path for the road). NM also has a habitat stamp you usually need to buy. With AZ there's none of those complications - no vest, no stamp, and plenty of public land. And in the S half you've got "pure Sonoran" as well as Sonoran-Chihuahuan transition. The out-of-state license is $20 a day for short trips. You can buy it online. I hope this helps. Do your homework so you know how to follow the law, and come have a good time. In reality, in a "free country" such as Germany or USA compliance is a matter of personal responsibility and discretion, and the penalties for minor infractions are minor. But, everyone appreciates a well-mannered guest. And, the penalties for significant infractions are, well, significant. So again, do your homework, please follow the laws (all of them), and come have fun. Willkommen.